Tiffin Metal Products has been designing and fabricating the finest evidence, visitor and gun lockers for over 30 years under the Sentinel Security name. We traditionally manufacture from powder coated or stainless steel with features such as pass-thru or non-pass thru available with keyless, key drop or coin type (visitor) locks. Our newest Non Pass-Thru Locker design allows for the lockers to be converted into a pass-thru type at a later date. 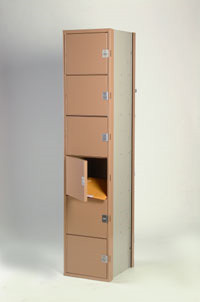 Our lockers are used in police stations, correction facilities, courts, airports and postal facilities, to name a few. New products this year include the new AIRFLOW Wardrobe Locker designed for law enforcement. This system allows a constant flow of fresh air to pass through the various compartments of the locker, which promotes the drying of body armor and other gear. 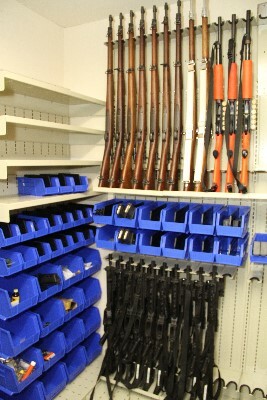 We have also introduced the Stainless Steel Coin Operated Pistol locker, which may also be set for free use. This application is best used in buildings such as courts, where weapons cannot be carried into the building. No matter what your requirements may be, Tiffin Metal Products can help you find a system to meet your needs. We also offer custom fabrication. Please call Tiffin Metal Products today and let us put years of experience to work for you.